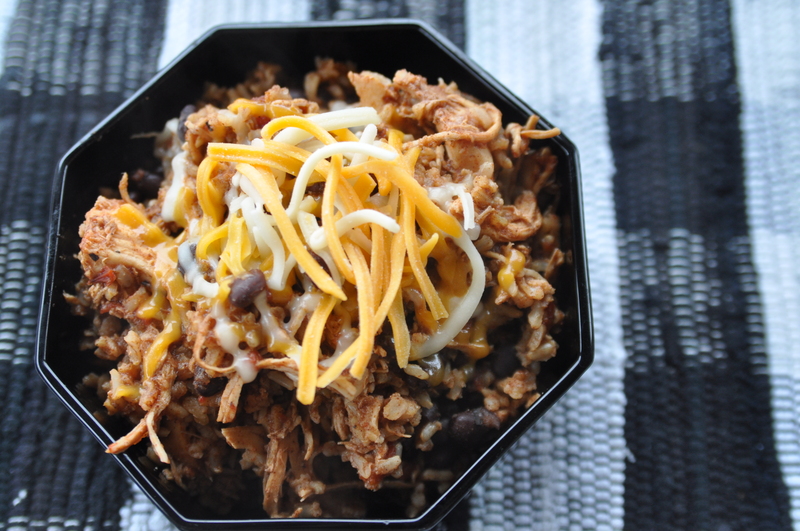 Chicken Burrito Bowls – Mama, Can I Lick the Spoon? The weather here – as in most of the country – remains cold. It’s wet, cold, dreary. Yuck. At school, the kids in every grade I teach – from kindergarten to fifth grade – are nuts. Most of them haven’t been outside for recess all week. They are stir-crazy, wiggly, giggly, loud. I can see the toll this is taking on their teachers every time a class is walked to my room. The teachers are weary. They are tired of being cooped up with these kids. They are tired of not seeing the sun for nearly two weeks. We are all worn out. I feel like all I do is fuss – and I am not a fusser by nature. I’m a happy, bubbly, sunshine-y kind of teacher. When you spend a day – or a week – doing something that is completely against your nature, you end up even more exhausted than usual. At the end of a day spent with crazy children, all I want to do when I walk through the door at home is collapse. But when you’re a mom, that’s really not an option. There is homework to oversee and dinner to make. The depth of love I feel for my crock pot at moments like this is probably unnatural. 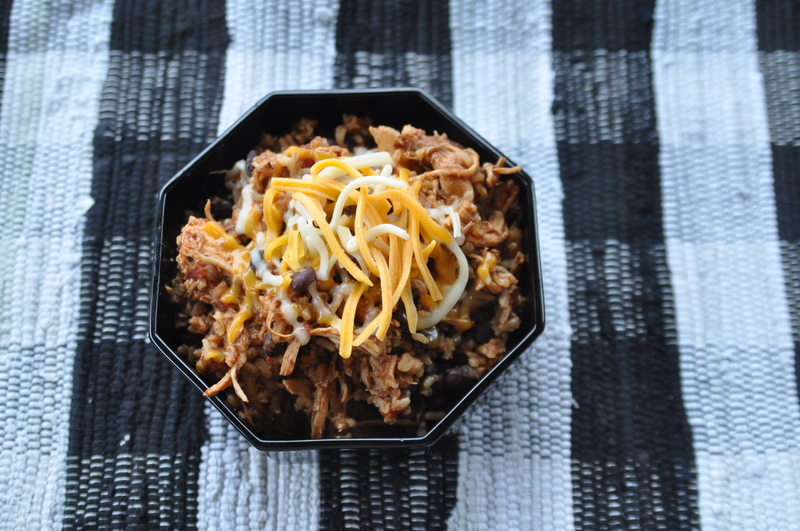 This recipe started out as an experiment and ended with the members of my family scraping the bottom of the crock pot to get every last bite. Place chicken breasts in the bottom of the crock pot. Add tomatoes, beans, and seasonings. Pour chicken stock over everything. DO NOT ADD the rice or cheese yet. Cook on low 6-8 hours. 1 hour before serving time, turn heat to high, fish out the chicken breasts, and use a fork to shred them. Taste the mixture and adjust seasoning if needed. Add the rice and stir. Add the chicken back in. Cook for 45 minutes. Top with cheese and wait 5-10 minutes until it melts. Well Duh #1: Yes, you have to drain the beans. I usually pour the cans into a strainer and run cool water over them until they no longer appear sudsy. Well Duh #2: If you want to use instant white rice, go right ahead! Well Duh #3: I was lucky because Michael was home so I asked him to turn the crock pot on at 10:00, so my meal cooked for six hours before I got home. If you have a programmable crock pot, you can set it to turn on later so that you have 6 hours of cooking time. If you don’t, it’s really not a big deal. The chicken will just be a little harder to fish out because it will be falling apart. I have let this cook for nearly 10 hours before (It was an accident. I forgot it was cooking and I ran errands before coming home!) and it was just fine. Well Du #4: If you’re not into the whole bowl thing, this would be really yummy wrapped in flour tortillas or even used in lettuce wraps! Like I said, my family couldn’t get enough of this! It was warm and delicious! The kids at school are still squirrely. Slow Cooker Cube Steak | Mama, Can I Lick the Spoon?